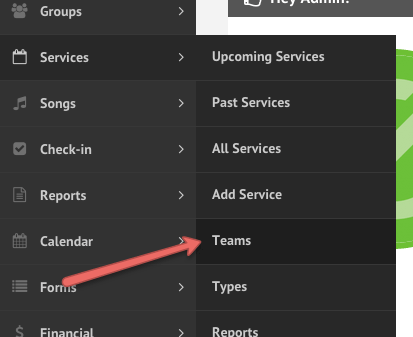 To manage Service teams, navigate to the admin area and click Services > Teams. On this page you have the option of managing an existing team or adding a new team. Teams, like departments, are then divided into sub-teams. Select an existing sub-team, or create a new one. Once the sub-team is created, add team members by clicking the ‘Add Team Member’ button. There are two ways to add volunteers to a team. You can either browse through the list of departments, sub-departments and positions and find volunteers who are assigned to specific positions, or you can type their name into the search box.